Holy St. Joseph, spouse of Mary, be mindful of him, pray for him, watch over him. Guardian of the paradise of the new Adam, provide for his temporal wants. Faithful guardian of the most precious of all treasures, I beseech you to bring this matter to a happy end if it be for the glory of God and the good of his soul. Bishop Conley of Lincoln did a nice piece about St. Joseph and the miraculous Loretto stairs. Reminds me: I want to go to there. 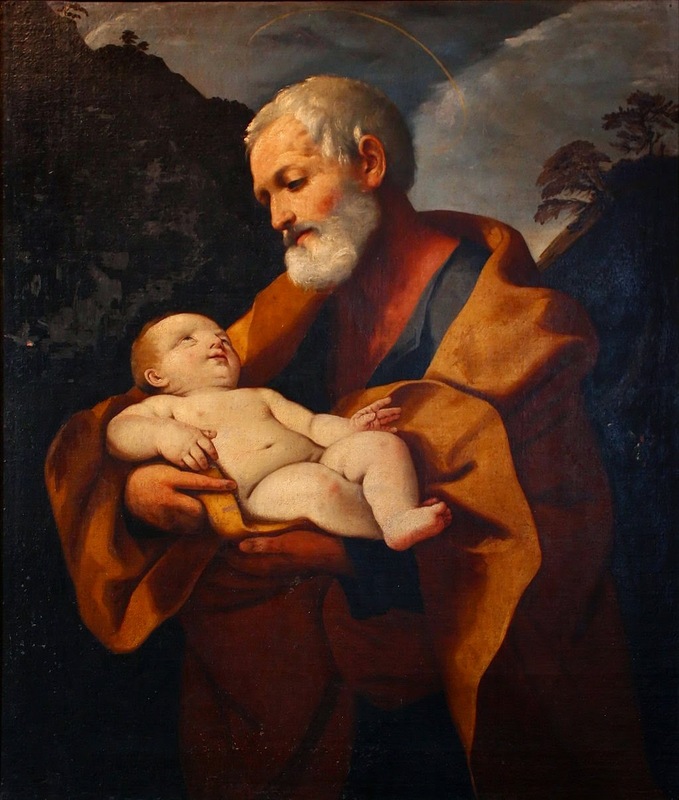 I know I've run this before, but I really do love this piece on the manliness of St. Joseph by Joseph Fornieri. The Holy Father has been doing an absolutely smashing weekly catechesis on the family (I take it that since the West has forgotten what the family is, he is literally teaching us: what is a mother, what is a father, what is a child, what is a grandparent?) Since St. Joseph is the patron of fathers, here are the texts on fatherhood. He starts via negativa, about society at large and children in specific in a fatherless society (absent both God the Father and our own fathers). The following week, specifically invoking St. Joseph, he takes up the question of the goodness and importance of fathers. I would like to begin from some expressions that are found in the Book of Proverbs, words that a father addresses to his son: “My son, if your heart is wise, my heart too will be glad. My soul will rejoice when your lips speak what is right” (Proverbs 23:15-16). One cannot express better the pride and emotion of a father who realizes that he has transmitted to his son what truly counts in life, namely, a wise heart. This father does not say: “I am proud of you because you are, in fact, just like me, because you repeat the things that I say and do.” No, he says something far more important to him, which we can interpret thus: “I will be happy every time that I see you act with wisdom, and I will be moved every time I hear you speak what is right. This is what I wanted to leave you, so that it would become something of yours: the attitude to feel and act, to speak and judge with wisdom and righteousness. And so that you would be able to be like this, I taught you things you did not know, I corrected errors that you did not see. I made you feel a profound and, at the same time, discreet affection, which perhaps you did not recognize fully when you were young and uncertain. I gave you a witness of rigor and firmness, which perhaps you did not understand, when you would only have wished for complicity and protection. I had to put myself first to the test of wisdom of heart, and to watch over excesses of sentiment and resentment, to bear the weight of the inevitable misunderstandings and find the right words to make myself understood. Now, when I see that you seek to be like this with your children, and with everyone, I am moved. I am happy to be your father.” And that is what a wise father says, a mature father. It's easy to extrapolate from this image, this experience, to the reciprocal delight of God the Father and Christ the Son and between the Father and his son's adopted brothers and genuine disciples. Pope Francis has a great devotion to St. Joseph. He consecrated the entire Vatican to him and St. Michael near the start of his papacy. And one of the few personal items he had flown to him from Argentina was a statue of sleeping St. Joseph that he uses to "stash" prayer requests. (Link is to a RomeReports video that includes footage of Francis speaking of St. Joseph in English, should that curiosity interest you). Here's an authentic recipe for St. Joseph's Zeppole (cream puffs). I have to admit I never remember about zeppole until too late in the day to start cream puffs. So I buy plain ones, slice them in half, and add the lemon and orange peel and chopped chocolate. Not as good, but I think my children are fooled. Happy feast day! And Good St. Joseph, protect us and pray for us.